A teardown of the newly launched OnePlus 6T reveals that the company is using an optical in-display fingerprint sensor. The camera that recognizes the fingerprint gets light from the AMOLED display that shines the light only in one direction (towards the camera). Overall, the implementation is well done and this could pave the way for in-display selfie cameras in future phones. The OnePlus 6T has been a great device so far and one of the main USPs of this phone is its in-display fingerprint sensor. A teardown by Zack of the popular YouTube channel JerryRigEverything reveals exactly what makes this technology tick. The OnePlus 6T sports an optical in-display fingerprint sensor and the way it works could mean that in-display selfie cameras are not far away. Zack first starts off by opening the back of the device and unplugging the battery. He then goes on to dissociate the motherboard and the primary and secondary cameras. It is to be noted that there is no heat pipe or thermal paste of any sort on the motherboard. 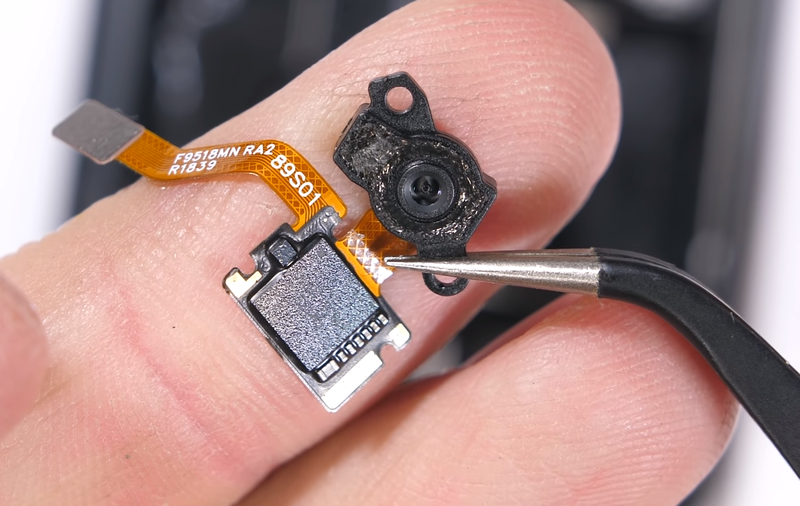 Removing the bottom plastic reveals the daughter board and while a headphone jack could probably have been accommodated, Zack feels that it was probably an intentional decision to drive sales of the wireless OnePlus Bullet earphones. After removing a few other surrounding components, Zack finally reaches the area where the in-display fingerprint sensor is located. The fingerprint reader assembly consists of a camera unit and the actual sensor. The camera gets its illumination via the green orb that is projected on the display while the sensor is activated. Removing the in-display fingerprint sensor assembly does not seem to affect the actual display in any way, which means that OEMs can now include in-display selfie cameras without having to resort to a notch. Zack then goes on to do a partial re-assembly of the components to check if the screen still works and found that light from the screen shines only in one direction (outward), which helps in better illumination for the fingerprint sensor. Surprisingly, the in-display fingerprint sensor worked just as new after re-assembly. LG and a few others have started looking into using in-display selfie cameras already and we might seeing the first phones using this technology in 2019. While OnePlus should be commended for having done a good job with the in-display fingerprint sensor, optical sensors aren't as accurate as ultrasonic fingerprint sensors. An ultrasonic fingerprint sensor can map the fingerprint's contour in 3D and works even when the finger is soiled. Samsung is expected to use ultrasonic in-display fingerprint sensors in all Galaxy S10 variants and hopefully, the technology gets cheap enough to drive mass adoption.